Why would you want to seed a tomato? 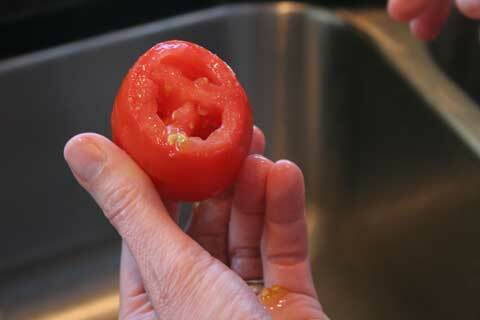 The seed sections of any tomato are very watery. Generally when we are using tomatoes they are going in a salad or a sandwich or they are being used as a vegetables where less water is better. As a matter of habit I always seed tomatoes before using them for anything. And the truth is, the seed pulp is tasteless anyway. Here's how to remove the seed. You can do this any number of ways. You can cut the tomato in half crosswise (in other words if the tomato were a globe you might cut it at the equator) or you can simply shave off the top or bottom and get the same results, which is what I've done with the Roma pictured above. Stick your finger into each section and the pulp will squirt out. I should warn you that sometimes it will come out quite forcefully and land on your clothing so insert your finger gently working the pulp out of each section. Also...do this over the sink. Once all sections are clear you can slice or dice in any way you need.